What a gift that would be to fly an airplane! The recipient of this gift will take the controls on their very first flight with one of our highly trained flight instructors giving instruction. They will learn about the airplane during the walk-around preflight inspection and once the engine starts, they will learn to taxi, do the run up and takeoff! Once in the air, they will cruise over beautiful northwest NJ while on the controls of the aircraft learning basic maneuvers. An experience they’ll never forget! Once on the ground the instructor will answer any questions they may have and fill out a logbook (extra) for their first official flight hour! 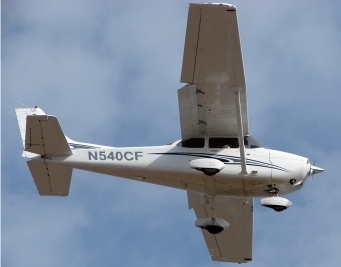 The standard gift certificate is one-hour of flight instruction in a Cessna 172SP. Upgrade to the Cessna 172 Garmin G1000, a Technically Advanced aircraft with an all glass cockpit. Looking for more performance? Fly our all composite Cirrus SR22 equipped with a state-of-the-art glass cockpit. The Cirrus is also equipped with the only U.S. FAA certified aircraft parachute system which enhances safety. You may purchase a flight using the Buy Now button below. We'll email a gift certificate to you that is valid for 1 year from the date of purchase! Certified Flyers can also customize your Gift Certificate for any amount of flight time. Give us a call at 973-539-4080 seven days a week between 8am and 6pm. I got this as a gift for my boyfriend's 27th birthday this past weekend, since he's wanted to fly ever since he was little. I surprised him with it as we were driving to the Morristown airport, and he was THRILLED! The instructor at Certified Flyers was very thorough and professional, we had an amazing flight, and I loved that I was able to share the experience as a passenger! My boyfriend was all smiles the entire time AND the entire weekend after. Completely worth every penny, and we would do it again in a heartbeat!